A shoulder injury can significantly affect your ability to conduct activities of daily living, such as brushing your teeth, feeding yourself, and driving. And if your job requires lifting heavy items or operating equipment, the cause for concern is magnified. This is often the case with rotator cuff injuries. The shoulder is a ball-and-socket joint consisting of the humerus (upper arm bone, which has a “ball” at the top end) and the scapula (which houses the “socket”). It’s held together by muscles, tendons, and ligaments which join together to form what’s known as the rotator cuff. The rotator cuff provides stability to the shoulder and allows us to move our arms. When there is an injury to this group of muscles, tendons, and ligaments, it could be either a partial tear (the muscle or ligaments have a fissure) or a complete tear (the soft tissue is ripped all the way through). Rotator cuff injuries are the result of either trauma or repetitive movement. It often affects people with jobs that require constant heavy lifting, such as construction workers; or athletes whose sport requires continuous lifting of the arms, such as a tennis player or a baseball pitcher. If you’re experiencing symptoms of a rotator cuff injury, your physician will do a physical examination of your shoulder by testing your range of motion. If a tear is suspected, the doctor will likely order X-Rays or an MRI to confirm the diagnosis. Treatment starts in a conservative manner: Physical therapy is helpful to regain muscle strength and most people recover from injury this way. However, your doctor may also recommend anti-inflammatory medications and cortisone injections. As a last resort, if there is no considerable improvement after consistent conservative treatment, the doctor may discuss surgery. 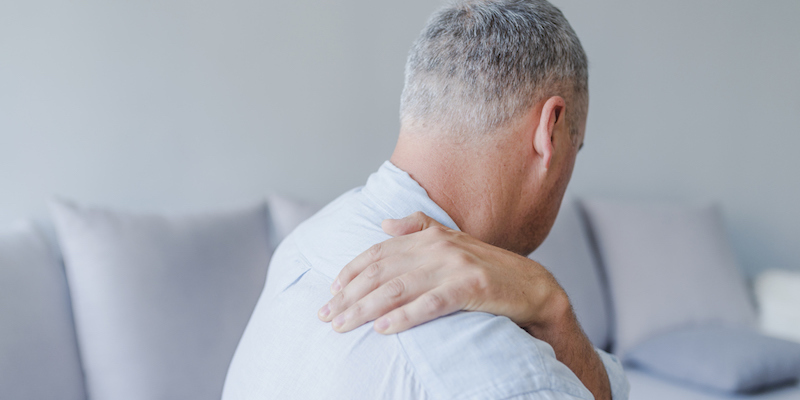 Home remedies for treating pain and discomfort associated with a rotator cuff injury include the RICE method: Rest, Ice, Compression, and Elevation. When applying ice, do so for 10 minutes at a time and compress with an elastic bandage. Stretching exercises will help to preserve your range of motion. It is important to note that you should only do these exercises if your medical provider has cleared you to do so. While some people prefer to power through pain, it’s crucial to get treatment for a rotator cuff injury. Failing to do so could result in frozen shoulder, permanent loss of full range of motion, or degeneration of soft tissue around the shoulder joint. The best way to prevent this type of injury is to strengthen the rotator cuff. If you’ve previously had a rotator cuff tear, consult with your physical therapist for specific exercises. Other measures include good posture and using free weights to strengthen your shoulders. At The Orthopedic Clinic, we want you to live your life in full motion. If you’re experiencing symptoms related to a rotator cuff injury, let us help you. We’ll tailor a treatment plan that’s best for your lifestyle and get you back to doing the things you love.